The easy and comfortable choice for your vacation on the canals. Here at Hotels Afloat we understand that flexibility and choice is often the key to a great holiday, which is why we offer a range of half-board cruises. Depending upon which barge you select, you may enjoy up to 4 meals ashore in restaurants of your choice, or dine out each evening. Our half-board hotel barges offer comfortable accommodation for families and groups of friends alike. Children welcome! 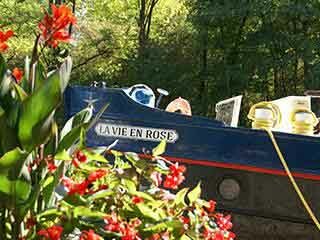 For the 2019 season, we are delighted to add 'La Vie en Rose' to our fleet, cruising on the Canal du Centre through the stunning vineyards. Specially selected following inspection, the following are among the best hotel barges operating in Europe. Select a barge and click for full details including photo galleries, itineraries, rates and special offers.